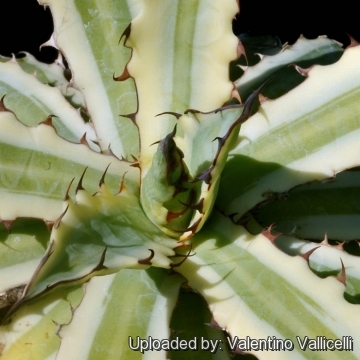 Agave heteracantha var. splendens (Jacobi) A.Terracc. in A.Terracc. 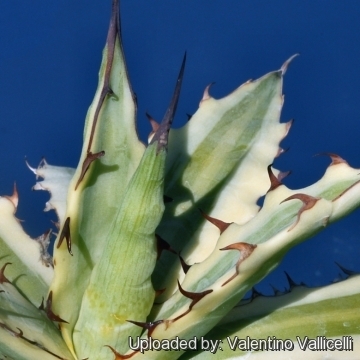 Agave xylonacantha var. mediopicta Trel. 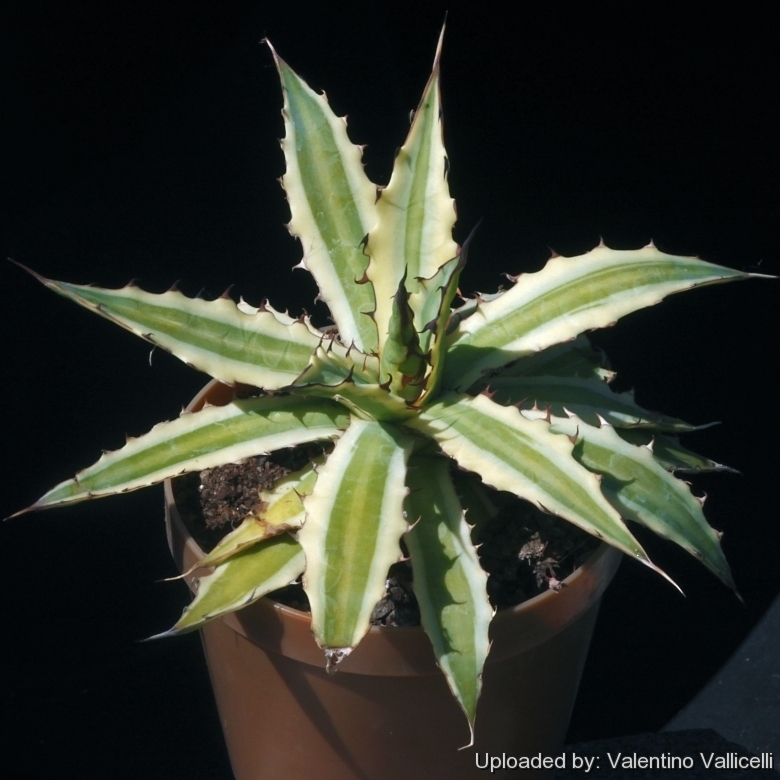 Description: This is one of the most beautiful variegated agave that seem to be getting better and better all the time. It generally produces a single rosette but occasionally some plants will produce offsets with time. In bright light, low light, rain, sun or during foggy gloomy periods, this variegation shines. Rosete: Symmetrical up to 30 cm tall and 75 cm wide and has an open, free form and produces relatively few leaves compared to other agaves. Leaves: Usually not more than 35 per plant, 30-35 cm long, 2-3 cm wide with a medium green to glaucous-green, central stripe, bordered by a wide creamy yellow edge that ages to white. Ensiform-lanceolate, tappering from the base, rather rigid, rough, often broadest in the middle, long-accuminated, rounded below, plane to concave above. The margins of the leaves have broad, flat, recurved (almost hooked), maroon-black, almost papery spines on broad teats (usually 2-5 cm apart) that run together along the leaf margin that are arranged in an irregular fashion, making the leaves look like old fashioned wood saw blades. Terminal spine, trigonus-subulate, grooved at the base, stout, 2,5-5 cm, maroon-black to grey. Leaf-imprints can be found on both upper and lower leaf-faces. Inflorescence: Erect 3-6 m tall, sinuous, spicate and long tappering, flowering in the upper ½ or ⅓ part. Flowers: 3-8 together, 40-50 mm long, ovarium fusiform, 20-35 mm long, tepals greenish to pale yellow, tube 3-5 mm long, lobes equal 15-20 mm long. Agave flowers attract hummingbirds. Blooming seson: Spring to summer. It flowers only once every 15-25 years and the main rosette dies after blooming. 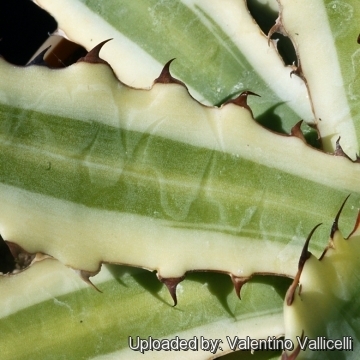 Remarks: This plant is related Agave lophanthatha. The leaf margins with large flattened, several tipped, teeth are like an exaggeration of the forms known Agave lophanthatha. Agave xylonacantha cv. Frostbite: nice variegated form with a glaucous-green, central stripe, bordered by a wide creamy yellow edge. Cultivation and Propagation: It is a stunning specimen plant for containers or a well drained spot in the garden noted as rare in cultivation. It tend to be slow grower, but worth the effort. Grow it in porous soil with adequate drainage. It does well in full sun or a lightly shaded area. Water thoroughly when soil is dry to the touch. In winter watering this plant can be done once every 1-2 months, there is no need to mist the leaves. It is theoretically hardy to -3° C, particularly when dry but it is best to avoid severe freezing temperatures. Heat Tolerance: Excellent. Propagation: This cultivar usually do not produce offsets and most of the plant in the trade comes from micropropagation. Relatively easy to propagate by suckers (if eventually available) Remove the basal suckers in spring or summer and let the cuttings dry for a few days before inserting in compost.. only problem is the logistics of getting to the suckers - very sharp spines and suckers usually right up against, or underneath the mother plant. Use: These striking plants are wonderful when used for accent or simply to provide some all year round foliage colour and often used in a pot as a patio plant, they make an eye-catching statement and along with other evergreen plants in pots, can be moved around to change the scenery or position to give more shelter. Warning: Wear thick gloves when handling.